Mark Z. Danielewski has an aura around him. His exceptional first novel House of Leaves remains one of the finest examples of “cult” literature out there, shrouded in mystery but still possessing a glut of immersive details in which to lose oneself. The book runs simultaneous timelines and boasts a labyrinth of footnotes, dark alleys and cellar doors to explore. Most notable in House of Leaves is Danielewski’s skilled work with his page layouts: with masterful precision, his story suddenly runs up the margin, scribbles across the gutter, or closes in on itself. The effect is brilliant and claustrophobic, and adds a genuine element of fear in its ability to make the reader doubt the safety of something as steadfast as how a sentence appears on the page. Fans have congregated online in an attempt to unlock the secrets of House of Leaves. Why does the word ‘House’ appear in blue ink? Did the mythical first edition really exist, featuring the Braille plates mentioned in the colophon? As the years went on and Danielewski kept writing, discussion seeped outward: how best to read the enigmatic Only Revolutions, a book with two tangled story lines running simultaneously towards the center, starting from either outer cover? Or, where could a person track down the first Dutch edition of The Fifty-Year Sword, a ghost story later reprinted in a latched box with gorgeous illustrations made entirely from stitched thread? 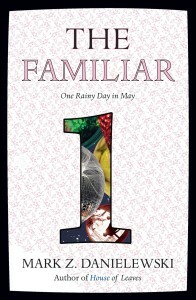 Blame is perhaps not the best word, but I suspect the living annotations of the Mark Z. Danielewski online community to be responsible for the series The Familiar and its first volume, One Rainy Day in May. The Familiar is the product of our collective, online fandom: it reads as if Danielewski ran the metrics on top-viewed subreddits and tried to connect to his target audience in as many ways possible. Immersive indie video games, dubstep, kittens, Breaking Bad-style gang activity, a pulp-novel detective, meta sci-fi, and off-the-grid hackers make up much of the novel’s tertiary plots. Chapters have introductory quotes with semi-obscure references to Cypress Hill, Blade Runner and Lone Wolf and Cub, and one even features a strip from the webcomic xkcd. It reads awkwardly calculated for teenage cool-factor, almost as if churned out by some pop-culture narrative robot or a board room trying to calculate the Danielewski book we’ve all been waiting for. This is all intentional, but also deeply alienating. If so much of The Familiar is about connecting in this way, what of those readers who lack the familiarity with those contemporary touchstones? What if we’re not interested in speculating on online message boards, endlessly discussing theories around Danielewski’s enigmas that may or may not be addressed in subsequent volumes? We’re left simply with the story, which with the exception of a few standout threads is thin at best. The Familiar is a system of disparate plotlines surrounding an epileptic teenage girl named Xanther. Luckily, Xanther and her parents are the best parts of the novel, but Danielewski repeatedly veers away from them in an attempt to dazzle us with intrigue. On the titular rainy day in May, Xanther and her stepfather Anwar drive around Los Angeles on the way to a great surprise. Xanther’s anxiety and anticipation become our own: she’s curiouser and curiouser about what Anwar has in store for her, and grows increasingly anxious about her surroundings. “How many raindrops,” she wonders, staring outside the window. It’s a perfectly teenage concern, muddled needlessly by big-picture, youthful philosophizing. She’s particularly insignificant this rainy day, one lost in a number she can’t even comprehend. Danielewski interrupts her story periodically with raindrops of text, cascading in rays of letters collecting in inky puddles across the page. Her thread is the best Danielewski has ever written: he seamlessly burrows into Xanther’s teenage mind, full of uhms, likes, questioning lilts and early-young-adult wonderment. We share with her the excitement, pain, and awkward glow of growing up. With Xanther, Danielewski’s textual experiments illustrate rather than orate, and this freedom allows him to write, for once, from the heart. While complex, Xanther and her family make The Familiar a joy to experience. They are creatively, passionately rendered, and fully-realized characters in a book otherwise filled with sketches. Told in alternating snippets for over 800 pages, there’s very little to say about any non-Xanther plots aside from their surface conceit. It’s disappointing to jump from Xanther’s family to the Armenian Shnork, to Luther’s LA gang, to Jingjing at a party in Singapore (told in impenetrable “Singlish” slang), or to detective Özgür and his underwhelming noir. Their stories bloat The Familiar and feel empty in comparison to Xanther and her parents. While at times quite beautiful and engaging, the form of The Familiar is also disappointing. Each of Danielewski’s threads boast a unique look, reminiscent of the author’s past books and their gleeful derailment of text alignment. But unlike the author’s previous novels, The Familiar uses these tricks not to further the story but to simply differentiate between characters. Aside from looking cool, there’s no further purpose. Seeing the word “Familiar” in color, too, just makes The Familiar feel all the more rote, again like the author is doing exactly what he thinks his readers want. 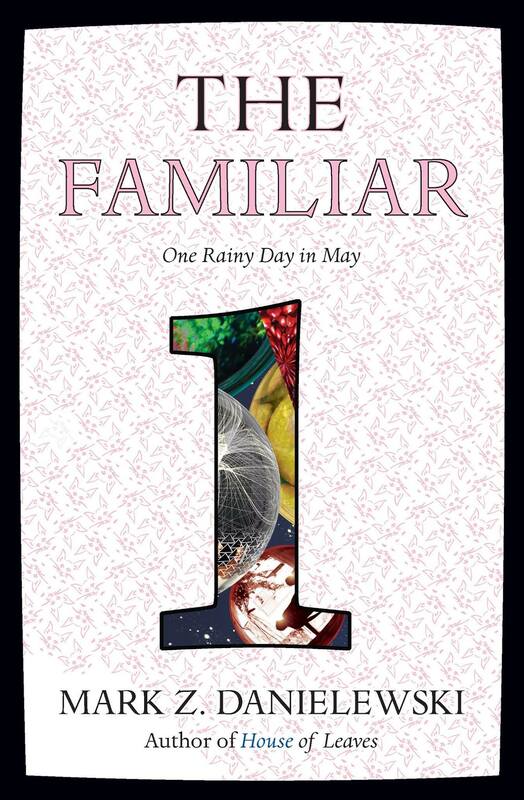 It’s important to keep in mind that this is Volume 1 of The Familiar, and that in an early press release Danielewski announced plans for 26 more (Volume 2, Into the Forest, is due out in October and can already be preordered on Amazon). Volume One does little more than lay out its nearly ten separate threads, introduce a unique and intriguing narrative conceit, and develop, very abstractly, a source of tension for the series. It will be difficult to keep readers on board for 26 more books over the next decade (or more); Danielewski’s target audience will be well into their thirties by the end. Volume 1 is an entertaining diversion, but its surplus of confusion can be too easily read through and disregarded. Xanther’s story shows remarkable growth for Danielewski, but any excitement and emotion it may generate is quickly dashed by the author’s unrealized subplots that lack any sign of follow-through. There’s a genuinely great book buried under all of The Familiar‘s coding, but it’s already in need of a fan edit. It’s a shame that Danielewski’s planned the series to run for as long as he has, and it is disheartening to think of all the better novels that Danielewski could use that time to write instead.